My coworkers decided to throw away my creamer. For no other reason than they couldn’t figure out who it belonged to or how long it had been there. Oh gross! Irritating creamer that has been there for an unknown period of time but is still full and is taking up all the room in the fridge so I can’t shove my hundred and five cups of jello in there! I don’t know where you came from, but instead of asking anyone else, I’m just going to throw you out so there’s more room for my jello! MY JELLO IS MORE IMPORTANT THAN THIS CREAMER! 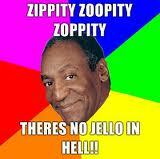 I must have my jello at all times!!!!!!! So now I have no creamer. Which means no more coffee. Which makes me an angry Megan. I wanted to say, what, you couldn’t ask? Are you going to buy me more creamer? Did you think you were the only one in the entire office who used that fridge? I must have been blind, I didn’t see your name on it, and I certainly didn’t realize that you owned it! Damn, you are one lucky office worker, to have your very own mini-fridge! Can you tell I’m cranky? This made for a great start to the morning. So now I guess I’ll be cranky all day. Just a suggestion, but I wouldn’t mess with a starving person’s food if I were you. Damn creamer disposing jello whores. [Anyway, I’m almost done with the first green yoga sock, which makes me happy (or, happier, as the case may be). I’m still not sure I’m in love with the yarn, but it’s pleasent enough to work with, not super stiff or scratchy. I’m just not 100% sure I’d buy yarn from Knit Picks again, if I had the choice. They gave me a tracking number that didn’t work (big pet peeve of mine, along with people who eat massive amounts of jello everyday), and the shipping costs were a bit stiff for one skein of yarn. The second picture is the yoga socks I finished on Monday. I like them, and I was going to list them yesterday, but I really didn’t love the way the photos came out. There is only so much you can edit out, you know? It was too dark, which was my fault, and my background wouldn’t cooperate. I’ll try again on Friday after work. Oh, and I sold this scarf yesterday! Granted, it was sold to a coworker, but still. I was so thrilled to sell something other than a pair of yoga socks that I forgot to give her the coupon code for free shipping! Hopefully this means people will start buying some of my other stuff! That would be amazing, those scarves are wicked pretty. Hang in there little ceramic coaster sets! Someone is going to love you someday!